ASUS' RT-AC5300 Wireless-AC5300 Tri-Band Gigabit Router is the second AC5300 router I've tested and ASUS' second based on Broadcom's new 4x4 radio (the RT-AC88U / RT-AC3100 was the first). The AC5300 has two 5 GHz radios vs. the AC88U's two and uses Broadcom's XStream technology. Wi-Fi Alliance MU-MIMO certification standard is not final and MU-MIMO have compatibility issues between different chipset in this stage. We will continually release new firmware to improve MU-MIMO performance. 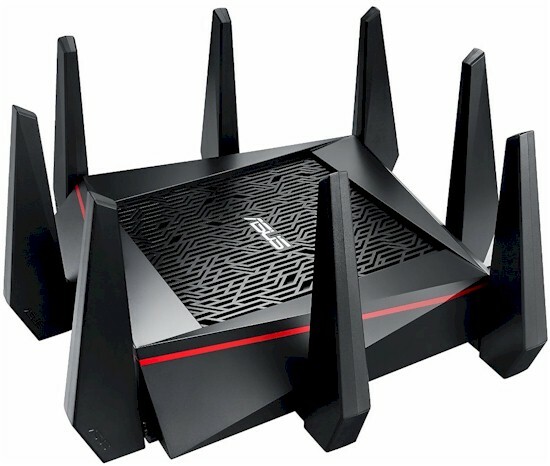 If you want to get the alpha firmware for early stage testing, please send mail to router_feedback@asus.com and use "RT-AC5300 MU-MIMO firmware" as mail title. I don't waste my time with alpha firmware, so MU-MIMO testing will wait until ASUS ponies up at least a beta quality release for MU-MIMO. By the way, I've never seen Wi-Fi Certification used as an excuse for a wireless product maker not releasing something, so I don't buy ASUS' explanation. I think the real reason is Broadcom hasn't fully baked MU-MIMO yet. The AC5300 is big in both size and price. Both it and the R8500 list for $400. Size-wise, the AC5300 actually has a smaller footprint than the R8500 (photo below), even with its eight removable external antennas. There is a lot of plastic in those antennas, mainly for the sake of design coolness. But their weight made about half the antennas in my two review samples easily flop over if they were not set straight up or the router moved. This got really annoying during testing. For cooling, the bottom of the router is mostly open except for a 2.75" x 2.75" solid square for the serial number label smack in the middle and triangular feet in four corners. The top has much narrower ventilation slits hidden in the maze-like design. There are no screw slots for wall / ceiling mounting. The meager set of indicators lights sits on the front panel with tiny grey icons to indicate function. I really wish designers would use high contrast markings and larger print; I can hardly read the damned things, even using a flashlight! Note there's only one indicator for all four LAN ports. For $400 and the target audience, I'd expect link / activity lights on each port. Short term confidentiality expired, so I was able to use the FCC photos for most component identification. The photos are from the original May 2015 filing; photos for the November 2015 Class II Permissive change have not been released yet. The photo below shows the innards with the top cover removed. The Ethernet connector slot in the cover indicates it is vertically flipped 180°. It looks like the fan was positioned over the left side hole in the heatsink. According to the Class II change, the fan has been removed. All key components are summarized in Table 1 and compared to the R8500 and ASUS' RT-AC88U, which has only one 5 GHz radio. Note the Realtek switch is clearly in the FCC filing photos and the Class II change letter doesn't mention removing it. But I'm puzzled why it would be included, given the Broadcom BCM4709C0 has its own built-in switch supporting aggregation. The gallery contains more photos and commentary. Bottom of board with heatsinks covering the two radio modules. The exposed device is 128 MB flash. Bottom with heatsinks and RF can tops removed. The upper, separate 5 GHz radio gets its own four antennas. That's the Realtek RTL8365MB switch to the right of the radio. The third BCM4366 radio sits above the interleaved 2.4 and 5 GHz amplifier sections. Closeup of one of four 2.4 / 5 GHz radio chains that share the four other antennas. You can more clearly see the RFMD 5 GHz power amps and Skyworks SE2623L 2.4 GHz power amps.